Of special importance for the development of the democratic society in Macedonia has been the constitution of the judiciary as the third autonomous sphere of power. All social actors agree on this, regardless of their ideological and political differences. Judicial power is exercised by courts. They are autonomous and independent. Courts judge on their basis of the Constitution and laws and international agreements ratified in accordance with the Constitution. There is one form of organization for the judiciary. The Macedonian Constitution prohibits emergency courts. A judge is elected without restriction of his/her term of office and cannot be transferred against his/her will. In order to protect the autonomy and independence of courts, the Constitution specifically enumerates the instances and reasons for which a judge may be discharged. Judges are granted immunity decided upon by the Assembly. The performance of a judge's office is incompatible with other public office, profession of membership in a political party. The intention is to apply strictly the principle of depoliticization of the judiciary. "The Public Judiciary Building, Skopje"
The draft of the new Courts Act defines the types, jurisdiction, establishment, organization and composition of courts, as well as court procedures. A European model of judiciary organization has been adopted, implementing the principle of the rule of law. For example, in addition to the abolition of what were known as Courts of Associated Labour - which had seriously undermined the judiciary system through incompetence and voluntarism - the new draft also envisages the abolition of the so-called Economic Courts. The cases which used to be within their jurisdiction are to be transferred to regular courts. The new judiciary organization envisages 28 basic courts and 3 higher courts. The Supreme Court is the highest court in the country ensuring uniformity in the implementation of the laws by the courts. The Republic's Judicial Council, as a new institution of the judiciary, is composed of seven members, elected from the ranks of outstanding members of the legal profession for a term of six years with the right to one reelection. This Council proposes to the Assembly the election and discharge of judges and determines proposals for the discharge of a judge's office in cases laid down in the Constitution, decides on the disciplinary answerability of judges and assesses the competence and ethics of judges in the performance of their office. 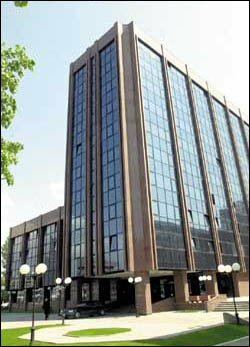 The Constitutional Court of Macedonia is a body of the Republic responsible for the protection of constitutionality and legality. In May 1994 the Assembly elected new members to make up a new constitutional Court. The court is composed of nine judges whose term of office is nine years without right to reelection. It decides on the conformity of laws with the Constitution, protects the freedom and rights of individuals and citizens, and rules on conflicts of competencies among holders of legislative, executive and judicial offices. The Constitutional Court also rules on the answerability of The President. The number of cases submitted to the Constitutional Court for ruling shows an upward tendency. Thus, while in the period 1990-1992 the annual number of cases was about 350, in 1993 it exceed 400, of which 284 were new initiatives, and 118 held over from the previous year. As far as new initiatives proceeding on the constitutionality and legality of various acts are concerned, 188 were submitted by citizens, 45 by companies, and other organization and associations, 23 by political parties, 14 by state institutions, 9 by municipal bodies and 6 by independent Representatives in the Assembly. According to the type of acts whose constitutionality and legality was disputed in 1993, the structure of the cases was as follows: 76 cases were related to laws, 42 to regulations passed by the Government and its ministries, 54 to municipal regulations, 94 to general regulations of companies and other organizations and associations. The Constitutional Court also ruled on 12 initiatives for the protection of the rights and freedoms of individuals and 7 concerning the re-examination of its own ruling. In 1993 the Constitutional Court was faced with increasingly complex cases in comparison to the preceding period. Most of the initiatives for disputing acts were submitted from the fields of labour relations, housing, communal activities and town planning, finance and prices, education, status and other issues. The Court has found a large number of acts and regulations to be unconstitutional: in 1993 there were 50 such cases, or 19% of the total 236 cases ruled upon. When analyzing the relatively large number of initiatives and the scope of work of the Constitutional Court, we must bear in mind the specific constitutional provisions in Macedonia. The constitutions of neighboring and some European countries allow only the president of other proponents of supreme power to dispute laws of regulations. The Macedonian Constitution, however, stipulates that every citizen may dispute a law, regulation or other general act independently of whether it concerns him or not. The very fact that in 1993 there were 188 citizens putting forward initiatives for the assessment of constitutionality and legality of acts, and the decisions passed by the Constitutional Court in this respect, imply that there is still a preference for group of professional protection, and that there is also a broad framework for the protection of human rights and freedoms. It is only to be expected that in the future the number of initiatives for the protection of individual rights and freedoms will grow, which is linked with the development of processes of ownership, economic and social differentiation in society.